A durable water-based enriched resin formula. Quick drying, low odour and fade resistant. Ideal for pre-treated and pressure treated woods such as sheds, fences and trellis. Touch dry in 2-4 hours, re-coat in 4-6 hours. Approx coverage 6m2 per litre. 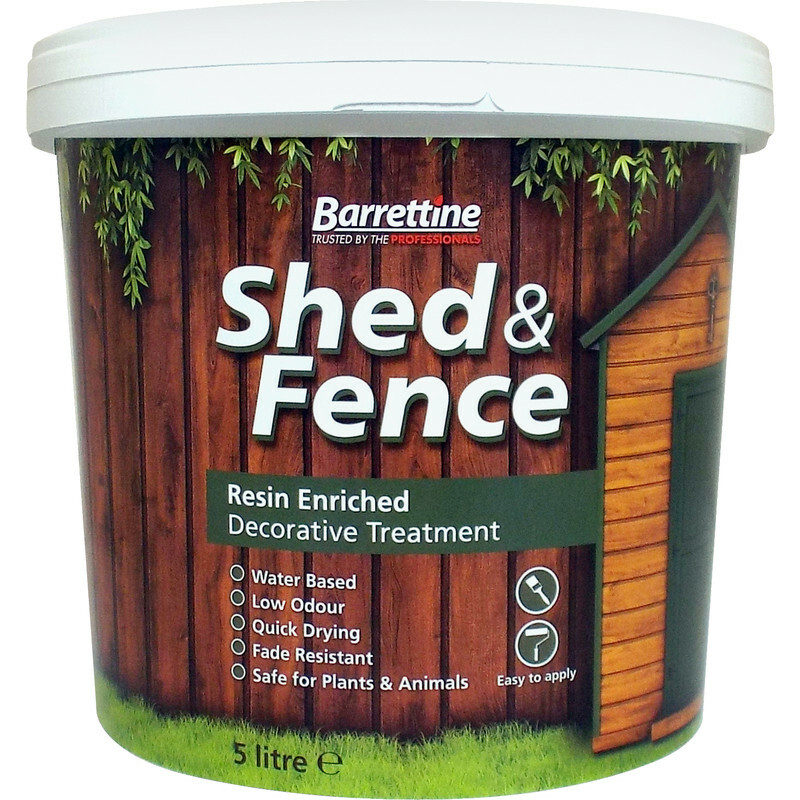 Shed & Fence Treatment 5L Dark Brown is rated 4.6 out of 5 by 94. Rated 5 out of 5 by Justin S from Short terms looks great. Long term yet to test Bought this rather than the usual Ronseal standard fence paint as wasnt 'really' happy with the finish of the latter, the last 2 times I had used it . Did use a Ronseal pump sprayer and had to thin it 50% to get it to spray well. Used 25 litres of paint to do 28 panels in a morning painting , including double painting about 12 off them, plus a shed and wood shed in that amount as well. Colour looks good , although rain 4 days afterwards, made the panels look like wet paint, it has dried back to normal again. At the price it is and ordered at 6pm and arrived at 9:30am the next morning is also a great reason to buy with minimal spend , unlike other retailers . A very happy punter all round. Rated 5 out of 5 by lyndon13 from Excellent coverage. I used this to treat my Deck. The coverage and the colour are both Excellent. Rated 2 out of 5 by Fence Paint from Not as good as other brands Half way through re painting my fence I ran out of another branded red cedar fence paint. I bought this paint as the price was very reasonable. I noticed straight away that the quality was not as good. The paint was a lot more watery and required two coats unlike the previous paint. I wouldn't buy this one again. Rated 5 out of 5 by FredUp from Quality product at a good price Checking stock and securing the required quantity was easy on the ToolStation website. I was met with friendly staff at both the Shipley and Bradford branches when I collected the paint. Free drink was a bonus! The product went on easy; using the correct, long-bristled brush that the counter guy in Bradford suggested. So far we cannot fault the product and the transformation it has brought to our garden - all the foliage seems to contrast and stand-out much more than it ever did when the fence was boring brown! Rated 5 out of 5 by Greenacres from Only wish I had found it earlier. Over the years I have used both Ronseal and Cuprinol Shed & Fence products, but for the last 2 days I have been using this Barrettine product and the difference from the other two brands is like chalk and cheese. The Barrettine product is thicker in texture, goes to the wood better and the finish is cleaner, fresher looking than the Ronseal or Cuprinol.